The possible scenarios you have to work on: fixing css problems in Internet Explorer, testing css box model in Internet Explorer, testing css float support in this browser, testing CSS positioning in Internet Explorer and many other problems. it should be only small part of your final work. The rest is to test your pages in all currently used versions of Internet Explorer and other web browsers. We have Web Developer extension for Firefox and similar tool for Opera browser. The biggest problem is with Internet Explorer. We couldn't have installed different versions of this browser on one computer. At least not so easy. However there is a tool that can help with no cost. Try the IETester software. IETester is a simple application which implements rendering engines from Internet Explorer 5.5, 6, 7 and 8 beta currently. Four different rendering engines are accessible from one user interface and help you with solution for fixing css problems in Internet Explorer, testing css box model in Internet Explorer and other jobs mentioned above. You will not see the user interfaces of this version of Internet Explorer but this is last thing that webdesigner/css coder needs. 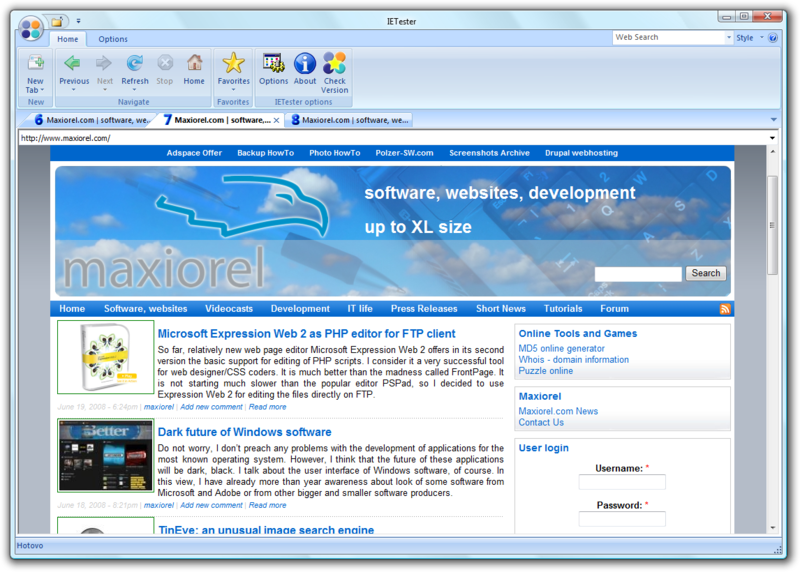 IETester has modern user interface with MS Office 2007 look. Just click the New Tab button and menu with different version of Internet Explorer will appear. Select the needed version. IETester will open a new tab with selected rendering engine and you could provide an URL you would like to see using selected version of IE rendering engine. There is another useful function in IETester. It could refresh opened pages with or without emptying the cache. Empty cache will ensure that your browser will not keep the temporary files before reloading the page. This is critical for correct refresh of edited css stylesheet for page. Since IETester is currently beta I recommend to regularly checking for a new version. This will be useful when the final version of Internet Explorer 8 will be available. Don't sleep and prepare for it now. So what about your sites? Will they need any optimization for IE8?